Tag Archive | "Blackwater Jeepers"
Can you tell us a little about yourself, and how long you have been a Jeeper? My name is Coty Byers and I am the president of Blackwater Jeepers. I am the father of two smart, beautiful daughters, and I have an addiction to Jeeps. Actually, it’s equally a Jeep addiction as it is an addiction of being around great people. Ironically, I first got into Jeeps because I wanted to get lost in the woods with a couple good friends; many years later, I ended up with way more great friends and less getting lost in the woods. Either way, I’ve been into different truck and car scenes in my lifetime, but never have I seen such a tight knit community as the one the Jeepers have. I’m sure the only one that compares is the Harley community, in my opinion. I’ve seen the Harley community do some amazing things all over the country and have nothing but respect for these guys. I see the Jeep community going along the same way. There are people in every community in need of a little help up from whatever situation has befallen on them. When you have an audience like both communities do, it’s our responsibility to use that in any positive way we can. Of course, none of us bought a Jeep or a bike because we wanted to do charity work. What happens, though, is you see a way to have fun while doing something positive for your community. Jeepers in the Tampa Bay area cover a gauntlet of charities and fundraisers; they do really great work. When I decided to start Blackwater Jeepers, I did not want a big group or to do charities. I was looking for a small group of friends to go on trail rides with and simply have fun. We wanted to keep it simple and help individuals in our community, but quietly. We knew we wouldn’t have a big presence and would be unable to cash flow a large charity event or fundraiser, nor did we want to. Helping individual families have a Christmas became how we were able to help each year. We still do it today and it’s an operation completely funded by members. Last year, we did receive a large and unexpected donation from someone outside the group who found out we had extra families that needed help. If this man and his family did not volunteer, we may not have been able to help those families — this is an example of the amazing people we get to meet every day. Blackwater Jeepers was an idea I came up with when we were trying to decide which group to join. After taking our time hanging out with each group — there were not as many at that time — finding which would be a good fit and events a reasonable distance away, I got to see things in each event and group I liked and some I wasn’t a fan of. Everyone wants to belong to something; I think many people search for a purpose until they stumble on something that just clicks. This led to the idea of a principled and moral group with one simple goal: to have fun. No BS, no one should feel unwelcome, no one gets judged on a banner or their Jeep, no real rules other than just be a good person. Basic, old-school ways and traditional values mixed with a little new-age thinking, you could say. Trust will be earned but is expected. When you learn to trust your people, you build a loyalty to each other. After that you realize you have more trust and loyalty to these people who were once strangers than you do your own family, so they become your family. These are the people you get up at midnight for because they broke down and cannot get home and you know they would do the same for you. That breeds respect because like any family, you may not like everyone, but you will be respectful to them. We have a low tolerance for disrespect in this group, and luckily we don’t see it often. But this also had an unexpected surprise: It developed a sense of pride and honor among the members to be part of a bigger picture. Each one flew a banner that cost a few dollars, but was worth a lot more than the vinyl it was printed on. Each member has a say and the members run this group. The entire leadership and its members put in work every day to run this group in the direction the members have asked and communicated to us that they want this ship to sail. We all feel honored to be able to do this and be apart of the entire Jeep community as a whole and contributing while doing what we love. Sounds crazy, I know. But to me, that’s the secret meaning behind “It’s a Jeep thing, you wouldn’t understand.” Truth is, I hated when I heard people use the word “family.” I thought, “I don’t know these people, much less call them family.” Before we started Blackwater Jeepers, I never understood. Over the years these people come to know more about you than your blood family. Plus, you can’t choose your blood family, but we do get to choose our Jeep families. So, if you own a Jeep and don’t understand what it’s like to have a Jeep family like I once did, you are probably not in the right group. As a veteran Jeeper, what advice would you give to someone new to the activity? Some advice I would give to a new Jeeper is simple. Rule No. 1: Never wheel alone. Rule No. 2: Take your time joining a group. Since you bought a Jeep, you’re obviously looking for adventure. So, find a few friends, or better yet, find a few groups in your area. Even if you never join, you will for sure find some friends to wheel with. Plus, trails are usually better with friends. Again, take your time before joining a group. As I said above, you will find one that fits you and feels right. If not, start your own. It’s not easy, but if your head is in it for the right reasons and you look after your people and your community, you will find people who want to join — but it doesn’t happen overnight. Can you tell us a Jeeping lesson you had to learn the hard way? A lesson I’ve learned the hard way is not every hole will be as deep as it was the last time you came through. Trails can change as the weather changes. Don’t assume, take safety equipment on the trails, do not wheel alone, and understand how to use all of your recovery equipment. I’ve been on recovery missions that lasted eight hours, so pack a snack. We once had a vehicle stranded deep in the woods with water halfway up the doors. It weighed about 6,500 pounds on dry land, so between the mud and water, our Jeep was not much help. We used pulleys to fraction the weight. That helped a lot, but there was a hidden rut. At about this time there was a girl that started getting dizzy because her sugar level had dropped. So we were now using pulleys and a high lift jack to get this rig out. Long story short, we used every bit of recovery gear we had and still could have used more. Also, apparently, snacks. The girl was fine, by the way. Please tell me a little about your group, the purpose, and the benefits to your members. Blackwater Jeepers was originally started in 2013, but we decided to join an international charter in 2014. We became the very first United States chapter for this group. The purpose was to help join the national and international Jeepers together and allow everyone to work together on goals to help each chapter contribute to their hometown community — at least, that was the plan. Unfortunately, sometimes the leadership in many cases grows an ego that forgets the original goal and loses focus. As too many do, they put money over people and members lose every time. We wanted to support our local vendors and sponsors, but they wanted everything purchased through them. One thing about the Jeep community is that it’s huge and small at the same time. What I mean is, though we are everywhere, it doesn’t take long to be called out if you’re not doing things for the right reasons. Most of us want to look out for Jeepers — not someone’s bank account. How long has your group been around, and who were the charter members? We originally started with about eight charter members. Unfortunately, life happens and, over time, we have lost six of the original eight members. Other than a couple, we have never lost a member we wanted to keep. When it’s time, it’s time, and like any group, there are people who get egos, want to profit, or take advantage of a member. These types of people are not a good fit in this group. The ones that currently run the core of this group have been here from the beginning and have kept this ship on course through some turbulent times. These people include Al Feliz, Carolyn Albritton, Belinda Vazquez and, of course, Billi Gibson. Carolyn recently stepped down, but the rest remain. Al Feliz has recently been made vice president and has been here for this group and its members day in and day out. Al is one of the biggest reasons this group has come this far. We all work as a team, regardless of how tough each situation is. Al and I have argued tooth and nail about things, but every single time we realized in the end we wanted to hit the same goals, we just have two different ways to get there. I told him at the very beginning that I didn’t promote him to just agree with me; I promoted him because he doesn’t agree with me on certain things and that helps this group and its members. Al is passionate about our community, so he never gives up. Finding solutions to problems when you have complete trust, loyalty and respect for each other means you won’t give up just because you can’t agree, allowing you to find an even better answer to the problem every time and never have a member quit because they disagreed. With that and the entire leadership team — from the ones that welcome people to our public page every single day to the treasurer that keeps our finances straight, the event coordinators that keep our calendar organized and our trail bosses that make every group ride safe and a learning experience — no one person runs this group. I have the honor of being called the “captain,” but this group runs like a well-oiled machine. It takes a team and the members are like our clients. If they are not happy, then we are not doing our job. In addition, years ago, I set up a private chat with all the local groups in and around our area and invited the president and vice president from each group to join in. This allowed all of us to better communicate issues before they became a problem. Plus, it helped us support each other’s events and learn to work together for all of our members. It has helped us find and pinpoint any specific person in our community that continues to be an issue and remove him or her from all groups if they continue to stir up trouble. I know this has really helped our group understand issues that are simply miscommunicated before it becomes a major issue. How many members do you currently have, and how does one become a member? We have never published how many members we currently have. The reason is that we’ve never wanted to be a numbers club. I will say, we originally never wanted to get bigger than 30 or 40 members, but we passed that long ago. It’s not about numbers here; it’s about the people. We have never lost a person we have wanted to keep. We’ve had to tighten down a few times over the years to slow people from joining. Currently, we require new probation members to be sponsored by a current member, attend at least two events, and attend at least two trail rides. The entire purpose is that you cannot learn enough about a group nor can these members learn enough about you by only meeting a couple times. You have to check us out, just as we need to know we can trust you around our family and kids. We are a wheeling Jeep family, so of course we want to see you on the trails — not just a parking lot. Our members range in age, but they are all mature enough to respect their fellow members and their club. Do you have group trail rides, and if so, how many times per year? We currently average about three or four trail rides per month. Depending on months with a lot of other events going on, we typically do night rides or cookouts. Because many of these rides will include a trained trail boss, they are open to everyone and beginner Jeepers and probation members are encouraged to join. Our trail bosses assist in recovery while on the trails and help teach new Jeepers proper techniques when winching as well as how to tread lightly to help keep these areas clean and open for the future. Our kids learn in the process, so we hope to continue this further in the future. We also try and remind members on our members-only page — along with our public pages — to practice safety on the trail, stay on trail, respect property, and try to hold safety-recovery classes on occasion to give Jeepers hands-on training. What other type of activities do you have for your members? Our group makes excuses to hang out together. We have fun doing anything from wrench parties at someone’s house to shooting at an outdoor range a member has access to. Cookouts are our favorite, but we also meet for dinners, attend events and fairs together, go fishing, and do pretty much anything we can find that gives us a reason to meet up. All in all, I would like to say thank you to Jeepin’ Central Florida for what you are doing. It’s been a really fun and cool experience so far working with you all and meeting your families. Seeing that you are also Jeepers goes a long way. As I said, we joined an international chapter to communicate and see the news of other groups around the country and even other countries. I look forward to seeing this magazine grow in hopes this can be our way to see what other communities are doing. There are so many great things happening that we hear very little about unless it’s on social media. Having one outlet to see the Jeepers up north pulling out stranded motorists during snowstorms, Jeepers coming together during floods to get elderly their medicine or get doctors and nurses to the hospital, seeing Jeepers help find and recover missing people in the forests — this is what grows public trust and strengthens this community. 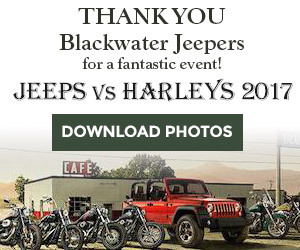 I also want to thank all the members of Blackwater Jeepers for pulling together all these years and stepping up every single time they’ve been asked. For everything you have done over the years for people who needed a helping hand and for not publishing it for attention. You’ve done these things because it was right and you did it knowing no one would ever know, and these individuals could never repay you. That shows your character and I’m honored to work everyday with each of you. You have all made this group what it is today, no matter how long you have been here. Please join us in congratulating Al Feliz on being appointed First Mate/Vice President of Blackwater Jeepers.